Strange as it seems, there was apparently plenty of rewarding jazz to be heard in Holland during the Nazi occupation of the 1940s despite rather monumental difficulties for the musicians. The Ramblers, which was founded in 1926, is considered the world’s oldest dance orchestra, still being occasionally active after 93 years. They gained a reputation as the Netherlands’ top swing band in the 1930s and a visiting Coleman Hawkins made several notable recordings with the group. The war years found the Nazis expelling two of their musicians (one of whom was killed) but the band continued to play concerts. They were in Belgium in 1944 when the country was liberated. The Ramblers have had an up and down existence since that time and the original members are long gone but a new version of the group still performs now and then. Someone should write a book about the history of this unique band. 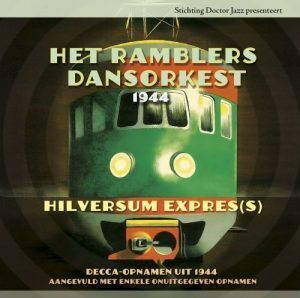 The Ramblers 1944 – Hilversum Express features the group on 26 selections during their period in Belgium. The 12-piece ensemble is in excellent form, the soloists are rewarding, and the music fits well into the mainstream swing of the period, with hints of Benny Goodman, Glenn Miller, and Duke Ellington. Despite their isolation from being under the Nazi occupation, the music does not sound behind the times. Avoiding jazz standards (other than “Farewell Blues” which is renamed “Au Revoir”), the Ramblers created music that must have served as a very welcome if temporary escape for war-weary Europeans.